THE RHEMA BALM OF GILEAD PURE/UNDILUTED HONEY! Nature Test: Pure/undiluted honey does not contain sugar of any kind. Therefore, it can never purge both adults and children no matter the quantity taken. This is the major test to identify pure/natural honey. Whenever you take honey and it purges, it shows that sugar had been added to it. 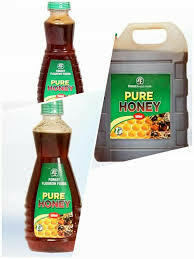 Real honey when taking in excess with pap or akanmu, it can even help to stop dysentery and pile to some extent. That is why it is medicinal! It cleanses the eyes and good for the brain especially the children’s brain. It also boosts libido when taken in excess with pap or akanmu. It is also a good remedy for cough. The Paper Test: Honey does not soak a plain sheet of paper no matter how light the plain sheet of paper is. But it remains afloat on the paper. When the honey is finally removed or poured out, a stain of syrup-like color is observed on the plain sheet of paper. If the plain sheet of paper is soaked; therefore, the honey is fake or diluted. The Matched Stick Test: When a matched stick is deep inside honey and scratch on the matched box, it will ignite fire because the matched stick is not soaked. But when the matched stick refuses to ignite fire because it is soaked; it shows that the honey is fake or diluted. Radio Nigeria @ Aduwawa Road, Benin City- Mr. Sule Daniel: 08069137788. Edo State Broadcasting Service (EBS) Aduwawa Road, Benin City: 07084849262. Palm House @ Environmental, Sapele Road, Benin City-Mrs. Ikponmwosa: 08028921105. Ministry of Education @ Account Department, Benin City: Madam Lolo: 08032734190. Marketers and distributors are needed for wholesale purchase. For further details: Website: www.therhemadevotionals.org. Facebook: www.facebook.com/therhemadevotionals. Kindly lay your requests/complaints to: therhemadevotionals@gmail.com.